UGEARS beginner model kits make building a fun and engaging hands-on experience. These kits are geared toward older kids ready to try something a little more involved. Each model is pieced together from flat, unfinished, laser-cut plywood parts that don’t need tools or glue to be assembled. The finished product has parts that move, too, to put these models in motion. Dimensions: Flat kit: 14.6" x 5.7" x 1.2"; Assembled Engine: 6.5" x 3" x 3.5"; Assembled Tractor: 7.9" x 3.4" x 5.4"; Assembled Box: 7.9" x 3.4" x 5.4"
Weight: Engine: 0.74 lb. ; Tractor: 1.07 lbs. ; Box: 1.84 lbs. I discovered UGEARS in Switzerland and now Grommet has it! 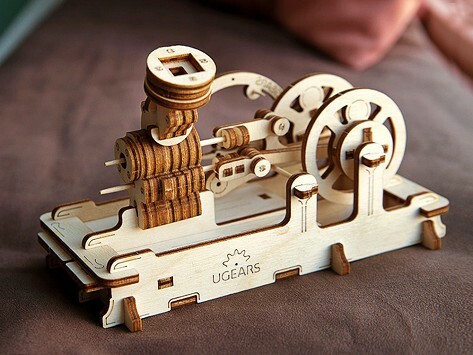 U-GEARS are a fantastic way to teach basic mechanics to anyone, adult or child! I should know - I work at an Ace Hardware store. I discovered my first UGEAR last year - 2018- while vacationing at a Christmas Markets tour in Basel, Switzerland. They had run out of tractors so I got the business card holder and couldn't wait to get home to assemble it! At work, I showed it to everyone - it was is a hit - and I commented how I hoped to see this imported into the US some day. And now, a few months later, I see that Grommet has the most popular styles!!! I'm so excited!!! I got this as a stocking stuffer for my soon to be son in law. He loved it! UGEARS founders Denys and Gennady share a fascination with the inner workings of machines and both are enamored with gears and levers. They realized we rarely get to see these parts in action anymore. To remedy that, they created model kits with movable parts that are engaging from start to finish. The duo and their Kiev, Ukraine-based team want to encourage folks to be more hands-on, so they strive to make the model-building process as fun as playing with the finished product. What begins as flat pieces of laser-cut plywood transforms into a model motorcycle, train, treasure box and more designs that all have parts that move in some way—like pistons, wheels, and, yes, gears. There are no tools or glue needed here and there are models suited to different ability levels. You can paint or finish your model once it's built. Denys made models as a child and wanted to recapture the joy of creating with your hands—which he thought, much like with gears, was something many of us have fallen out of touch with. And we can attest, it’s hard to keep your hands off a UGEARS model.